Georgia’s Biggest Educational Hypocrites, DeKalb’s Crawford Lewis, Atlanta’s Beverly Hall, & SACS’s Mark Elgart…Two Down, One To Go! | Georgia Teachers Speak Out! ← Coming Soon…Article On Glenn Brock, Educational Expert Or Educational Rogue? Georgia’s Biggest Educational Hypocrites, DeKalb’s Crawford Lewis, Atlanta’s Beverly Hall, & SACS’s Mark Elgart…Two Down, One To Go! MACE Coined The Phrase “Systematic Cheating,” Even In Torrential Rain! Where were all of Crawford Lewis’s critics, Beverly Hall’s critics, and Mark Elgart‘s critics…just three years ago? They were virtually ALL emanating from the MACE Office located in innocent lil Fayetteville, Georgia. I am not talking about a very few anonymous critics; I am talking about those critics who boldly wrote with their real names attached to their writings and those who boldly carried signs which proclaimed that the Beverly Hall-Atlanta Public Schools and the Crawford Lewis-led DeKalb County School System were “gangsta school systems.” We at MACE did this in our own media (http://www.theteachersadvocate.com), on the sidewalks, in the newspapers, and on television. I remember when Keith Whitney of Channel 11’s Eleven Alive News was laughing and could hardly believe that I was calling the DeKalb School System “a gangsta system” on TV. What did Crawford Lewis finally get indicted for? Didn’t the prosecutors call the school system “a criminal enterprise”? 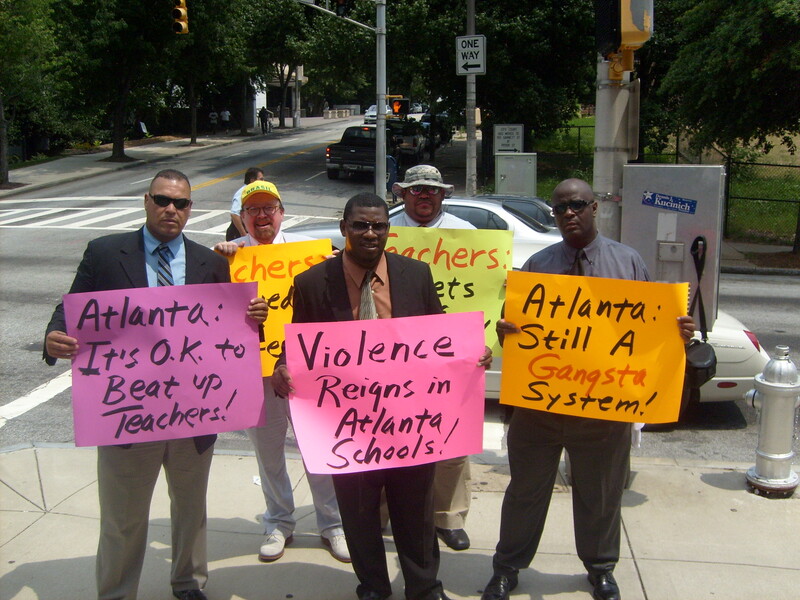 Hot, Sweaty Picket in July of 2008…Atlanta Still A Gangsta System! 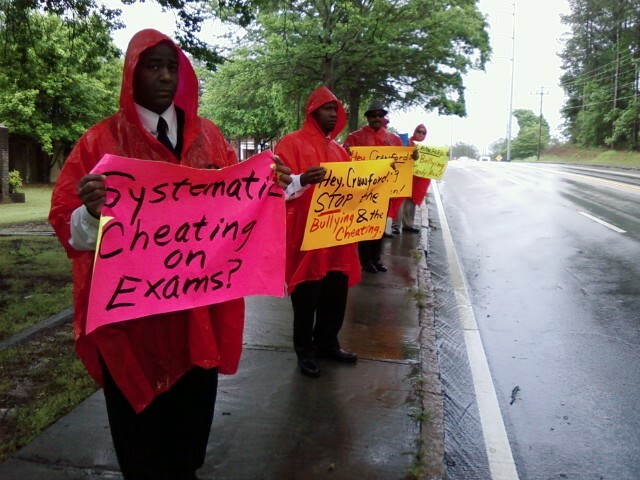 Didn’t the systematic cheating blow up in DeKalb County‘s face…AFTER MACE had been picketing several days in a row — even in torrential storms — against “systematic cheating” and “bullying”? Hasn’t MACE been calling the Atlanta Public Schools under the non-leadership of Beverly Hall “a gangsta system”? Yep, it was MACE as the lone voice in the educational desert here in Georgia. These are not just my fanciful notions. Go to our website and looks at the dozens of articles about Atlanta and DeKalb. Even go to the Archives section to see copies of our non-digital, paper magazines which pre-dated our website. These magazines go back to 1995. You will see. And you wonder why the administrators want and push for the teachers to join PAGE and GAE? Ha! Who was the first to publicly criticize SACS and Mark Elgart? It was Norreese L. Haynes, MACE‘s Vice Chairman and Chief Operating Officer as well as a former Clayton County Board of Education member and me. On the very day that Mark Elgart of SACS released his erroneously and flimsy report against the Clayton board, Mr. Haynes, within an hour, releases a response and sent it to the media (the AJC ran this press release for a good while as a PDF), calling SACS‘s Report “a sham and a farce.” Mr. Haynes‘s response went viral. Just Google “Mark Elgart,” and you will see an article that I wrote several years ago against Mark Elgart. In the headlines of this article, I called Mark Elgart a “Cry Baby.” This article is virtually always the first thing that pops up after you enter Elgart‘s name. I have probably written hundreds of website articles and internet postings on Mark Elgart and SACS…with my name boldly beside the articles. I have challenged Mr. Elgart to an open debate any time and any place in the State of Georgia concerning the capricious and arbitrary way that SACS applies its hypocritical standards. I have called SACS a private, money-grabbing, fake organization which the State of Georgia should jettison because it does much more harm than good. Mr. Elgart has refused to answer my challenge. I have called him, for years, one of the three biggest educational hypocrites in Georgia. I think that he is afraid to meet me in a formal debate with written proposition. I will take the Affirmative that SACS capriciously and arbitrarily applies its so-called standards among the various public school systems in Georgia. Why won’t Mark Elgart take the Negative on this Proposition? Is he afraid? One thing is for sure…the splendescent luster of SACS has been rightfully tarnished. Even The Atlanta Journal-Constitution did an extensive Sunday piece on SACS that must have made Mark Elgart‘s and the SACS Board of Directors’ faces turn about ten shades of Coca-Cola red. Now I am waiting for the General Assembly in Georgia to unhitched the HOPE Scholarship to Mark Elgart‘s ephemeral “approval.” Then, ole Markie can descend from Mt. Alpharetta and quit pretending to be the Educational Zeus of Georgia. Well said, Trotter. Thank you. Oh, wait a minute…that’s me. Ha!